Book this deal and get up to 35% off your stay at Flamingo Las Vegas. Who opened the flamingo Las Vegas and when? 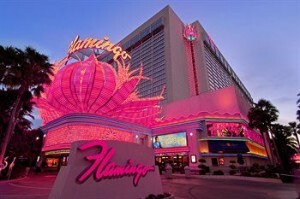 The Flamingo is one of the original Las Vegas hotels, opened by mobster Bugsy Siegel in 1946; billed as the world’s most luxurious in its time. The Flamingo defines Vegas. Is parking free at Flamingo Las Vegas? Guests will receive normal parking ticket when entering the garage and can paid at the kiosks prior to leaving. Note: Self-parking is complimentary for Platinum, Diamond and Seven Stars Total reward level guest. The GO rooms have been renovated – with the upper rooms the best choice as with most Vegas hotels. Some rooms have a view of the garden, filled with beautiful birds, plants and flowers – this area also makes a great place to take pictures, so don’t miss it if you can’t see it from your room. If you like bagels, head to Seattle’s Best inside Bills, but you’ll have to arrive early as they sell out quickly. For bargain beer, the bar in the back of Bills always has $1 draft beer that can be a hit or miss, but for a buck it’s well worth it. Discount Prime Rib at Flamingo? The Flamingo also has a great poker room for those who like to try their hand, and the $14.99 prime rib special at Steakhouse 46 is a true find. This low-key steakhouse has excellent food at a bargain price as well as outstanding service and is highly recommended.